A group of locals are taking part in a theatre production called Divided We Fall. It is a unique production of local stories told by a local cast. According to the Teresa Drew of the Port Alberni Friendship Center, casual racism refers to behaviour involving prejudices or negative stereotypes about people on the basis of race colour or ethnicity. “It is an insidious form of racism that tends to fly under the radar and is often ignored or down-played,” said Drew. Casual racism can include excluding certain people from social or employment situations, mockery, derision and dismissive comments. They will perform skits that tell the history of some of these phrases, offering monologues describing real life incidents of racism that the actors have experienced. “Did you know we use casual racism every day and most of us don’t even realize it?” asked Drew. The stories behind some of the common phrases still used today go back decades, if not centuries. For example, the term ‘hip, hip, hooray’, usually associated with winning and celebration, comes from early 19th century Germany. “Hep, hep, is German shepherd’s herding song; around the turn of the 19th century, people in Germany used it while going Hebrew-hunting in the Jewish parts of town,” wrote Drew. The Peanut Gallery is a term usually used to mock the opinions of people deemed uninformed. Its origins also start around the turn of the 19th century in vaudeville theatres. The Peanut Gallery is a nickname for the cheapest and presumably rowdiest seats in the theater, which were usually filled with minorities. Long time, ‘no see’ was originally a term used to make fun of Native Americans, mocking their use of the English language. “We invite everyone to grow and get informed together on what racism looks like, casual or otherwise,” writes Teresa Drew, speaking on behalf of the Together We Fall team. Drew says there will be first-hand true stories told by some of the performers. According to drew, many of the stories told in the play were collected through interviews with Nuu-chah-nulth people. “But the show is multi-cultural,” she added. “[There will be] stories about when people, as children first understood what racism is; monologues about actual racist incidents that have happened in our town, and helpful ideas on how to redirect your thinking and action the next time you encounter racism either towards yourself or towards others,” wrote Drew. 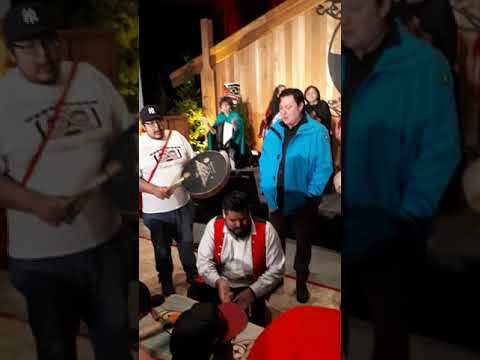 Nuu-chah-nulth performers include Darlene Leonew and Hinatinyis Brittany Johnson of Huu-ay-aht and Louise Martin of Tla-o-qui-aht. “We invite you to experience through the eyes of real people what it means to live with casual racism and why we need to stop it,” said Drew. Produced by the Port Alberni Friendship Center, Divided We Fall was made possible through funding by Ministry of Tourism, & Culture and partner Portal Players Dramatic Society. There will be two shows in February. On Feb. 14 the play will be shown at ADSS, 4000 Roger Street. On Feb. 15 the show will move to The Capitol Theatre at 4904 Argyle Street. Admittance is free and tickets are available at the Port Alberni Friendship Centre or at the door. Doors open at 7 p.m. and the show starts at 7:30 p.m. each night.